Alupro Ireland has a proven track record of developing and running programmes that make a difference. Our initiatives have made a major contribution to raising awareness, delivering lasting and positive behaviour change and increasing the recycling rate of not just aluminium packaging, but all metal packaging and other recyclable materials. Every Can Counts is helping to increase the recycling of drink cans used outside the home: at work, at college/university, at an event or festival and by people ‘on the go’. 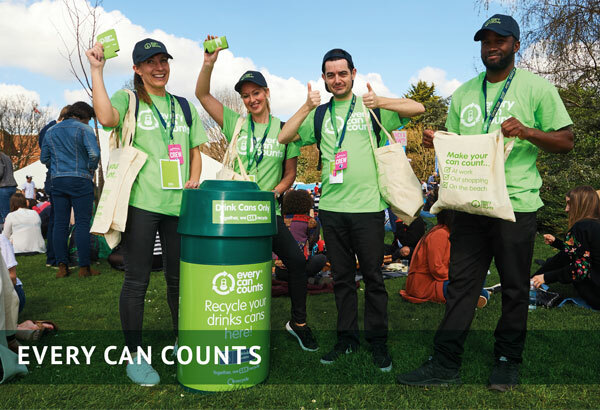 A partnership between the drink can manufacturers and the recycling industry, Every Can Counts was developed by Alupro and launched in the UK in 2009. It soon expanded into Europe and is currently running in twelve countries. Every Can Counts is seen by its funding partners as the ‘umbrella’ brand for promoting the unique sustainability of the drinks can across Europe.